I’m really grateful for that time. For the team that has opened their doors to me, gave me a lot of space, responsibilities and made me feel a part of them. 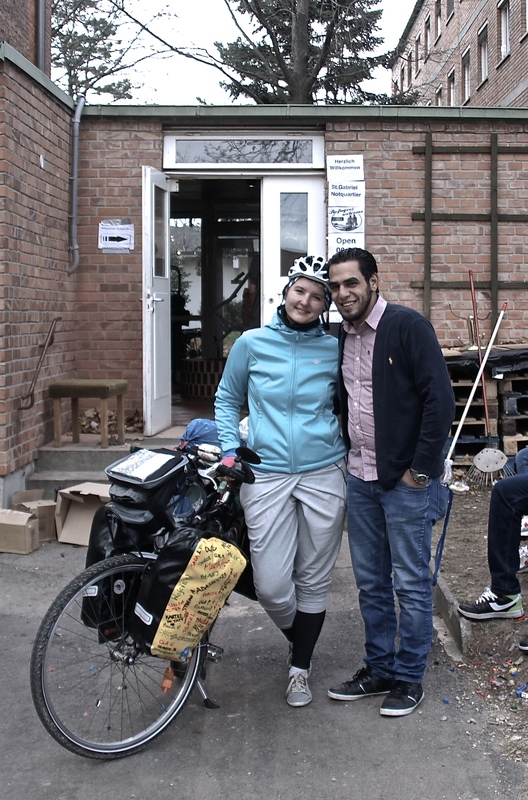 Omar, Hanes, Mohammad, Kasia, Beshy, Kati, Fayad – such a wonderful group of people. Thank you, guys, for this time! Natalie, Sara, other volunteers – thanks for sharing the responsibilities and that there have never been impossible things for us to do. But most of all I’m gratefull to all those that have shared their time and their stories with me, that opened their hearts and their souls. That have been welcoming me every day with the loud “Hello Kasia!” the moment I was entering the center. That have been calling me “Teacher” after all our English and German languages lessons. That have played frisbee with me. Ali, Mahdi, Muhammad, Sadeq, Ali (Muhammad), Rashed, Hussain and all the other people from Afghanistan, Syria, Iraq, Iran, Lebanon that I had a chance to meet – thank you so much!! I left the center with a heart full of sadness. It was not easy to pedal. Not only becasue my legs stopped being used to cycling (yes, three and half weeks of not cycling make a difference), but also becasue the legs wanted to go back. Hanes said that maybe I could consider cycling around the center as many kilometres as I need to reach Istanbul and this way I could make the kilometers and stay in the center. The way of eating the cake and having a cake at the same time. The wind was blowing quite strong and the sky was full of clouds. I have mistaken the way already after 10 Kilometers and only after the following five I realized that I was on my way back towards Vienna. There is a significant different between what the Google Maps shows and how Euro Velo in reality looks like. That was my second time with Euro Velo no 9 and I’m still not quite sure how much of a fan of it I am. Well, it certainly helps that it exists and I have a choice to use it or not – that’s for sure. The huge advantage is definitely that you cycle only along the bike roads which means it’s really safe. You meet only some tractors or combines from time to time. And you don’t really have to think – it’s enough to follow the signs – a bit like the paperchase game – you look for the sign and the you just cycle to the next sign. The biggest disadvatage for me is, however, that you cycle all the time through the fields and forests only. You feel quite isolated from the society. So I belive that the perfect choice for me is a combination of those two – becasue I really like to think, cop, look for the way, approach the people, ask them for the directions (Hello Harald! – if you read it), look for the signs.. Well, the whole me. Th sun was down at 4 pm. It was completely dark at 5 pm. I reached my destination some time around 6 pm. Matthias’ parents were expecting me with warm broccoli soup, lentils and dumplings. And it turned out that I can manage speaking German (althoug they both speak English) – they have been so patient to keep the conversation in German, so I could practise a bit. Thank you! And it made me feel I would really like to be back to speaking this language. I have actually already created a plan how to do it (do I always have to have a plan for everything?!). Some hours later I fell asleep in two seconds. Like a stone. Day 66: Those clouds! Stunning! Day 66: Euro Velo No 9 – welcome back! Day 66: The sun was slowly getting down..
Day 66: It’s quite cool, right?! Day 66: Day 66: From Moedling to Ternitz – quite a nice perspective, isn’t it?